Could you live in a single room house? I’m guessing more than one of us has spent time in a tiny apartment, but we sure didn’t like it. The idea of building a one-room house seems archaic and claustrophobic, but maybe that’s because we’re looking at the idea of rooms all wrong. 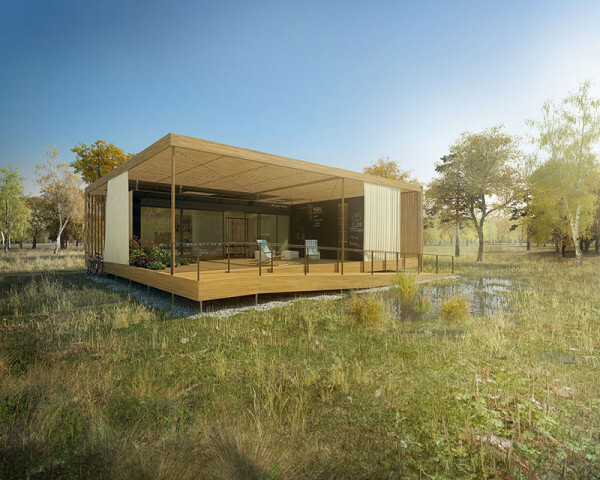 A team of student designers from the Czech Republic is working on a single-room home for the Department of Energy’s 6th biennial Solar Decathlon. The global competition challenges collegiate teams to design, build, and operate solar-powered houses that are cost-effective, energy-efficient, and attractive. The team from Czech Technical University believes that this is best achieved with one flex-purpose room, rather than several permanent ones. Called the AIR House, the futuristic dwelling is designed to be easily constructed, transportable, and yes, recyclable. The centerpiece of the design isn’t a particular room or interior feature, but rather a large outdoor activity area that’s designed to fit a number of uses. The idea is that only a small portion of the actual house will be enclosed, dramatically reducing heating and cooling costs, while still providing plenty of leisure area. The houses uses mono materials whenever necessary, and during construction, the AIR House’s material layers are kept distinct. This is intended to make recycling a breeze, if and when the structure reaches the end of its life cycle. One of the main materials chosen was Cross Laminated Timber panels. These panels produce zero waste during their production and emit nopollutants into the interior, therefore creating a pleasant odor microclimate.